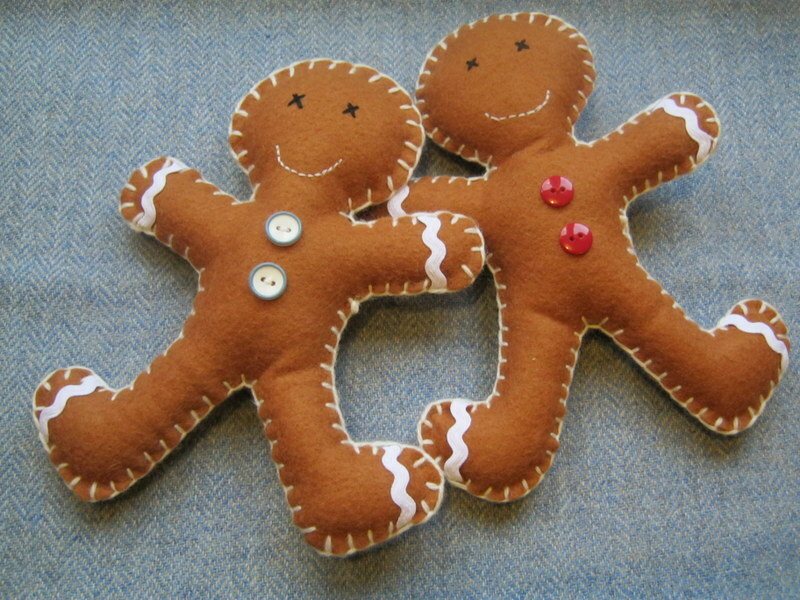 These sweet little fellows, I designed for a friend who after doing ‘The Gingerbread Man’ with the young children she worked with, thought it would be really nice to have something they could hold; hand around; and interact with the story. They are quite slim as I wanted little hands to be able to hold them but they are 20cm tall, so not little Christmas tree decorations, but you could easily scale them down 😉 Here’s a quick step by step guide on how I made them, in case you’d like to like to make one little man for yourself. Enough felt to make the front and back (I use wool felt rather than acrylic). White thread (I used normal sewing thread). Black embroidery thread (for the eyes). Paper and pencil (for template). A good pair of fabric scissors. 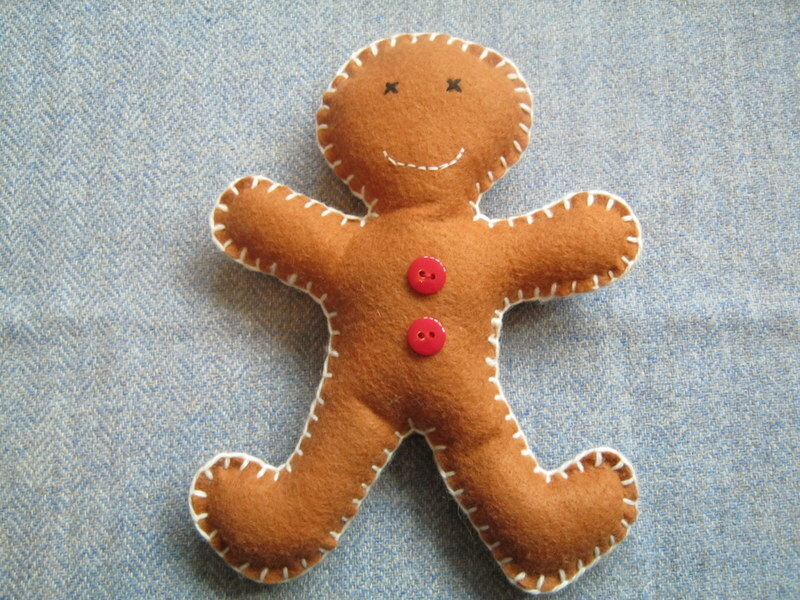 Stitches used: Back Stitch; Blanket Stitch; Cross stitch, Sewing on a button. Needles (one that has a wide eye for the wool but is sharp enough to go through the felt and one for sewing the detail). 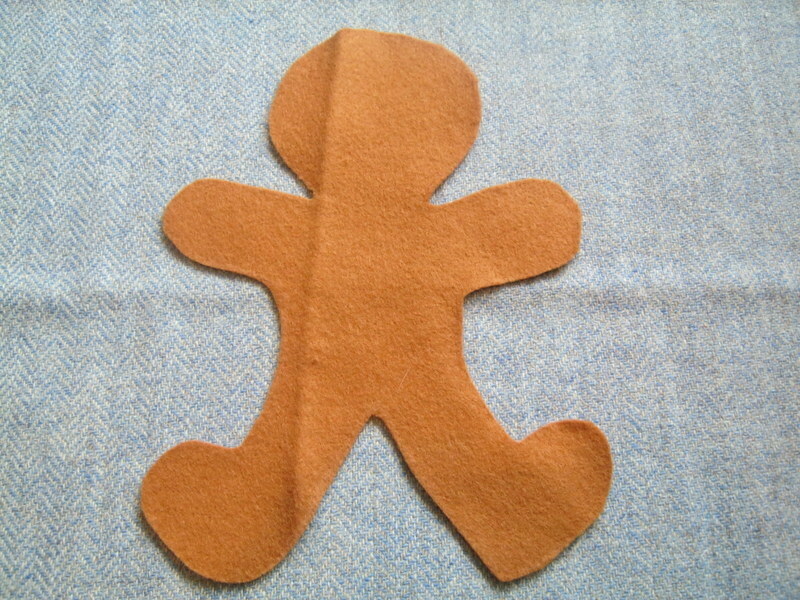 First draw the template of the gingerbread man on a piece of paper to make the template. I really can’t draw (my hubby laughed when I showed him my first go, he said it looked like an alien blog man!) but after a few goes, it looked all right. What I actually ended up doing was folding my template in half so that I could make a symmetrical template to work from. 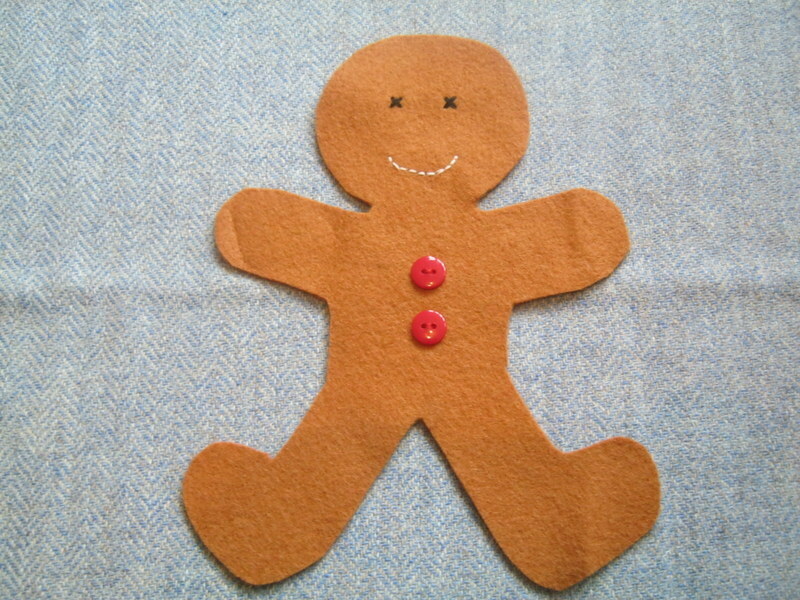 Once you are happy with the template, draw round it on the felt and cut out two pieces. 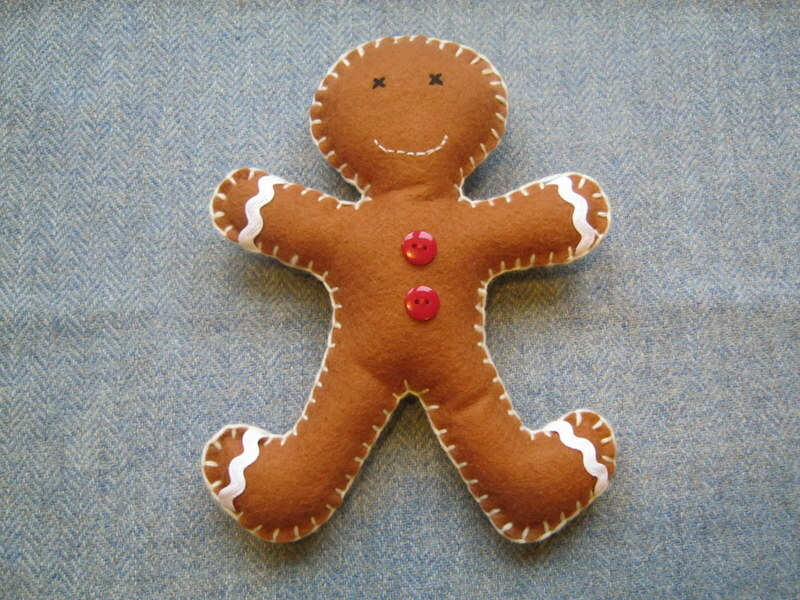 Once you have your felt pieces, sew on the buttons, the mouth (using back stitch) and the eyes (using cross stitch). It is so much easier to do this now rather than once you’ve sewn it together and/stuffed it. Next, sew around the edges with the wool, using a blanket stitch. Leave a small hole to stuff. 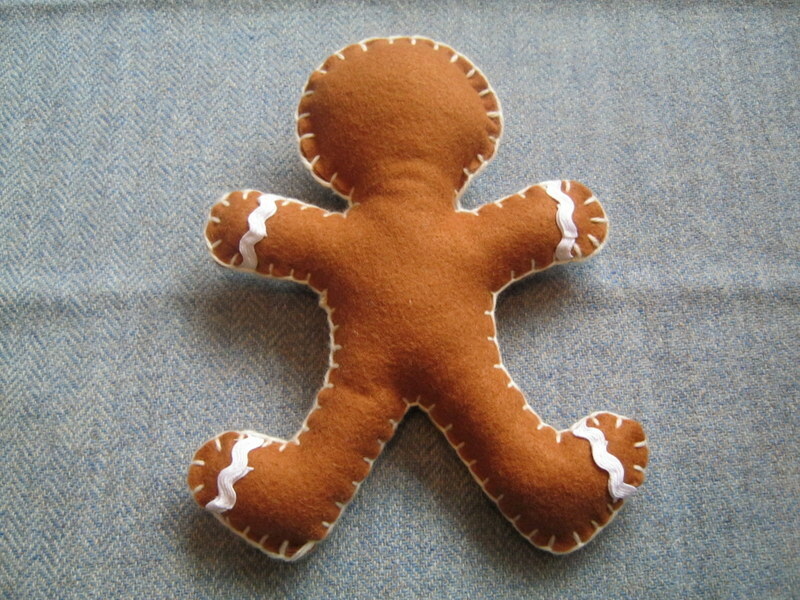 Lightly stuff the gingerbread man. You don’t want to over stuff it or it will feel like it’s coming out of the seams. Really the stuffing is to make it feel more like a biscuit than a pancake! To finish off, I added this wavy ribbon (but you don’t have to). I threaded it through the blanket stitch on either side of the foot/hand. I then sewed it in place on the back (through the ribbon and through the felt (no need to on the front as the combination of the blanket stitch and the stitches on the back keeps it place). Here’s the back. You can see the over lap if you look carefully. Depending what ribbon you use, you can stop the ribbon fraying by melting the tips with a match. Thank you, they were a lot of fun to make. So cute! It probably wouldn’t look as good (wouldn’t have the same kick to the legs), but you could draw round a cookie cutter for your template, if you have one the right size & really can’t draw. Thank you 🙂 I’ll definitely make them again (probably some mini ones in time for Christmas! ).